This is the first ever common immigration policy in Europe. It includes a proposal for member states to take in 20,000 refugees between them over the next two years as a way to share the burden of the crisis playing out daily in the Mediterranean. The UN estimates that 60,000 people have tried to make the journey to Europe in 2015 alone – and that 1,800 have died along the way. This policy is nothing short of a declaration of war on the member states – or at least on those who oppose devolving another chunk of their national sovereignty to Brussels – such as the UK. The regulation of international migration is one of the last bastions of national sovereignty in Europe. It touches on the very idea of who is entitled to belong to a country. That’s why it is such a sensitive topic, and why national governments have so far always resisted a common EU policy on the matter. Until now, the EU has bowed to the interests of member states in relation to stricter immigration controls, turning its back on what were the principles on which the EU was built – justice, fraternity and human rights. There is no way out of this situation. 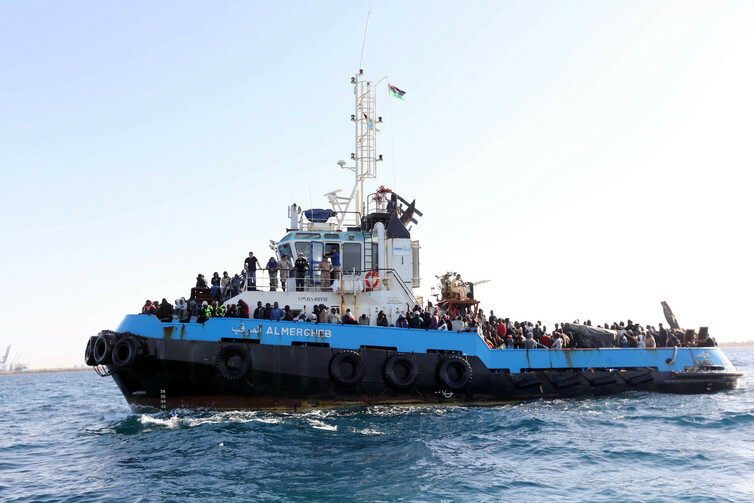 Migrants did not stop taking the treacherous passage across the Mediterranean when Italy put the brakes on its Mare Nostrum rescue programme, and they won’t stop now. The migration crisis can only be solved in a shared effort. EU countries need to do their bit, as well as the countries the people dying in the Mediterranean are fleeing. But a common policy on immigration is also a big risk for the EU. It pits supra-national governance against national sovereignty at a critical time for the union. UK home secretary Theresa May has already spoken out against the proposal, followed by other EU member states, such as Hungary. She has the right to do this – even if the commission is actually only asking the UK to take in around 2,000 refugees. But if the UK continues to resist joining the shared policy it would raise questions about its future relationship with Europe and accelerate the timetable for a possible exit. That leaves two solutions to the migration crisis. Europe could push forward in the integration process with those members (such as Germany and Italy) who are willing to integrate further, leaving out countries (including the UK) less willing to do so. The idea of a two-speed Europe has been around for a while and now it might become reality. Or, Europe could go back to what once was – a mere space of common trade, shedding its ambitions of further political integration. It’s hard to believe the future of Europe will be decided on immigration – a cause for which no national or European soldier would die. Yet, the union seems to have reached a critical point on this issue. The various nations involved in the project may try to cobble a solution together in the short term, but a significant change is on the horizon – and it may well be prompted by how the British public votes in its European referendum.